I love paint, all kinds, no paint snob here! Paint is the best way to make something look totally different, new or old if that is the your decorating style. Since painting furniture is my decorating love, I thought I would share a before and after with you of my spray project. and here is one from last Christmas…it’s a bit dark because it was night time but it is still festive and pretty. I spray painted the entire set with Rustoleum Semi-Gloss Protective Enamel, Black. Yep, you read that right…spray paint on an entire dining room table and 8 chairs. This is not very hard but there are a few things you should know. Buy one of the comfort spray handles that you can attach to the top of the spray can. Otherwise, you may never feel your finger again! Be sure to go lightly and use even strokes. When doing the table top this is MOST important. Hold the can far away from the table so that you do not see any paint lines. After painting is all done and dry you can distress, like I did. You a very fine sand paper so you don’t leave scratches on the paint. I then used a clear wax over my entire surface. 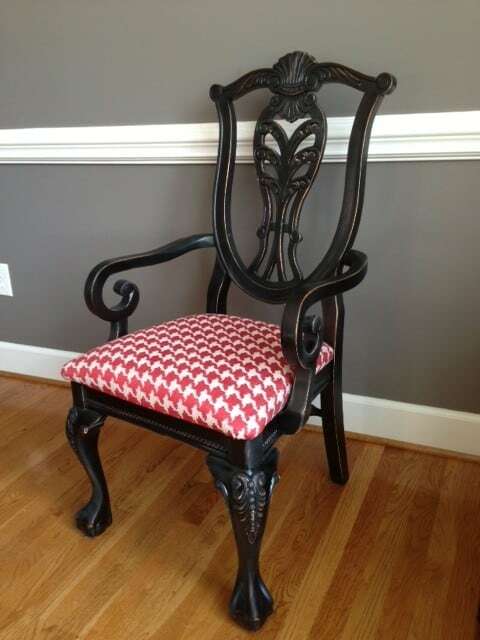 You can also see how I recovered the chairs with this beautiful red and cream houndstooth fabric. I have a tutorial HERE showing you how I recover chairs. Here is a sneak peak of my painted dresser I currently have in that space. It is painted with Annie Sloan Chalk Paint in Emperor’s Silk with Dark and Clear wax. You can see the finished dresser here. Do you tend to stick with one particular brand when you paint or are you like me and go with whatever you think will work? I love paint, do you? ***ROOM MAKEOVER UPDATE, click here! ***I also used spray paint on the chandelier, see it here. Thank you Bo! I love you and miss you lots!! ok Seriously AWESOME dining suite! You are so good at creating that slightly antiqued look on the paint. I love it – the change is mind boggling. 🙂 I love to paint things, too – but I’m not quite as good at it as you are. Working in it, though. Not ready to paint the table/chairs, but I’ve done a couple of dressers, etc. No paint loyalty for that kind of thing – just what works right. When I finally declutter this place, I’d like to pick up some pieces for a fun makeover. You are so sweet Jackie! Thank you for your kinds words and for stopping by my blog. If you have a chance I would love for you to add your email to my subscribe list that way you will get an email as soon as I post. Have a great day! Wow! What a beautiful transformation by a little pain! Very inspiring! I love the new look of your dining table. I admit, I am jealous with that. I actually love to paint but painting furniture is something really scary to me but not with walls. I am afraid that it will look the way I don’t want it to be. Thanks Deb, I totally understand where your husband is coming from with not wanting to paint a family piece! WOW it sounds great! We could sure use a table that size around here…my hubby and I both have 4 siblings each!! My table was from Rooms to Go, years ago, so I had no prob painting it! 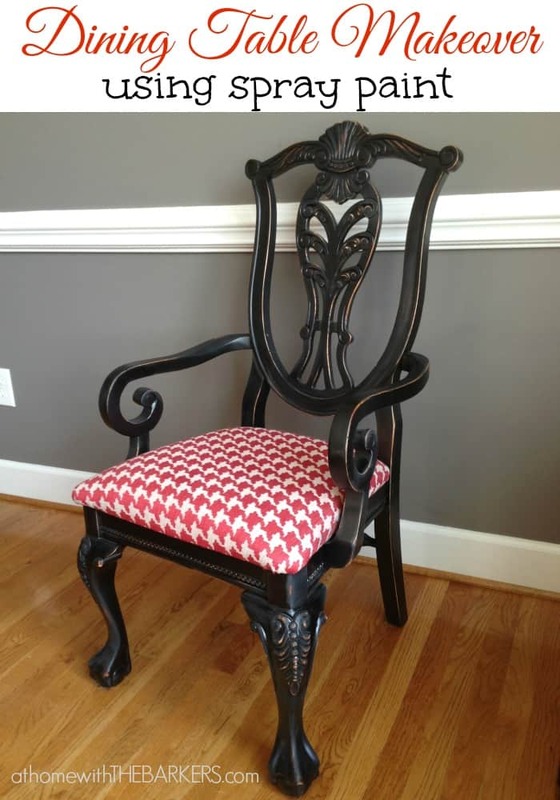 I love that black and the red herringbone fabric is stunning!! Love your new dining room set! The black paint makes such a difference! Thank you SO much Karianne! That means a lot coming from you…I love your blog and look at it often for inspiration! Nancy, THAT IS SO AWESOME!! Thank you so much! I look forward to seeing the post! Thanks Laura for stopping by! Wow, I’d be TERRIFIED to go after a set of dining room furniture with spray paint, but you have made that look amazing! Wow! The whole set looks GREAT! I know I’m a few months late, but how many cans of spray paint did you need for the whole project? I’ve been trying to repaint only the base of my kitchen table for months…and it’s just been sitting here primered since May (we’ve been without a kitchen table for that long!) and today while spray painting something else I wondered how spray paint would hold up on the base. Is yours still in good shape? Did you use any protective coating like polyurethane? Please share! Thanks. I just have to ask what color did you paint the walls in the dining room. Love it! Please tell me the color you painted the walls in dining room? Love it. I love the dining room suite. You are a very talented and BRAVE woman. Thanks so much for sharing. You are so sweet, thanks! The walls are painted in Gauntlet Grey from Sherwin Williams. I just found your blog and I love it. I too love Jesus and paint!!! I am always painting/changing something. Can’t wait to see what you do next!!! I am curious on the table and chairs you spray painted. Did you prime first? If so with what and was there any other prep? Did you sand or scuff up the finish? It’s stunning! I did not prime but I did clean it first. I used Rustoleum spray paint satin finish. I did distress with fine sand paper after I painted to have some of the wood show through. Thanks! Beautiful update and great tips! I share the LOVE OF PAINT with you my friend! Can’t get enough! Your dining set and tips ROCK! Wow! You could never tell these were spray painted. So pretty! It really creates a dramatic space now! I’m a paint lover, too, especially spray paint. I’m excited that you did the entire dining room set with it. And it turned out really stunning. Thanks for sharing at Throwback Thursday. Great update! The black paint really gives your dining set a nice update. I love how your chair fabric pops against the black color. You did such a great job!! I’m finding that I LOVE the look of distressed black furniture. I haven’t done any yet, but this inspires me to wait no longer. SHARING! WOW, I LOVE IT!!! May I ask, where did u find that chair fabric? Thank you!! I found that fabric about 4 years ago on clearance at a local mom and pop fabric store that is no longer in business. Sorry. 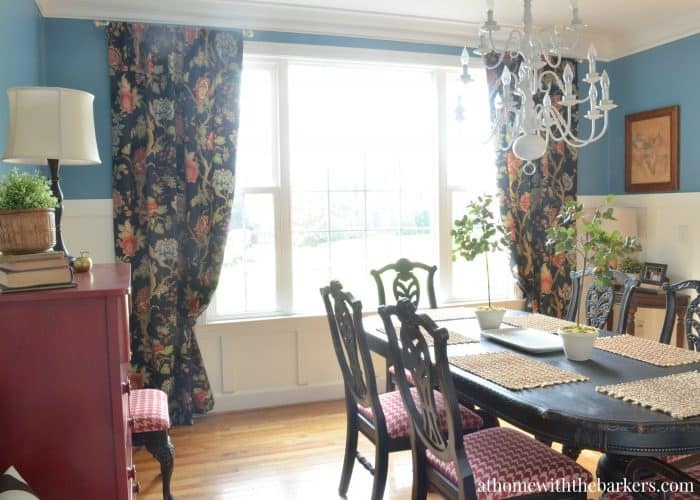 Hi Sonya, Oh my goodness….your dining room suite makeover is fabulous!!!! You brought the room to life with that black paint! It looks much more elegant than before. You did a great job! Love the new fabric on your chair seats, too. Beautiful! Found you on Throw Back Thursday! OH wow – this is gorgeous! 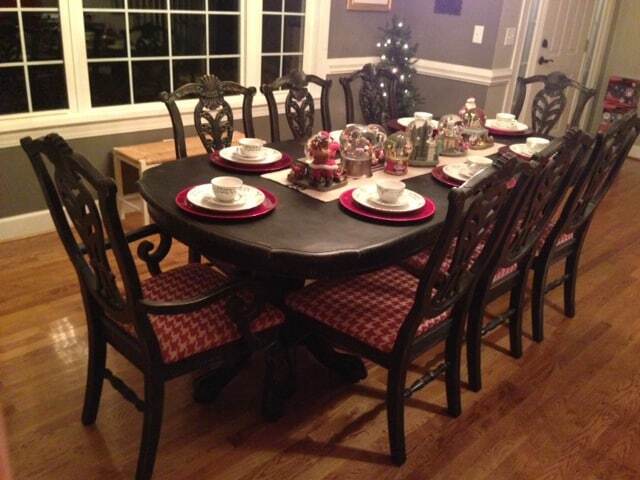 My formal dining room set was a hand-me-down 10 years ago. I was grateful to get it but its nothing I would have picked out myself. Plus it’s been through several moves and gets more scratched up each time. I am very seriously thinking about painting it black like you did yours – it turned out amazing! What kind of wax did you use? Does that work the same as a poly coat? The wax does seal the paint but it is a little different than poly. 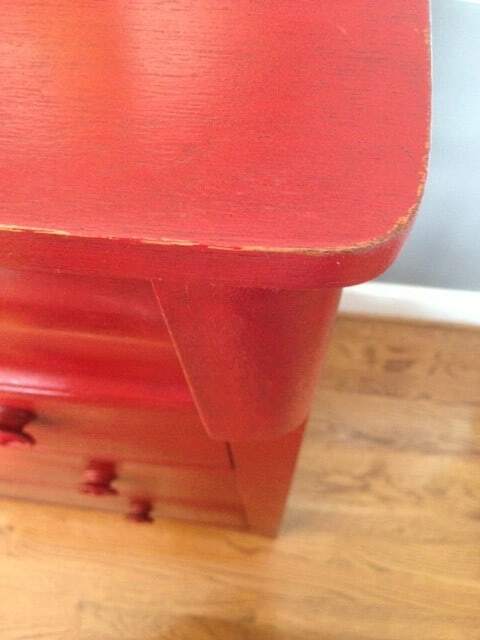 You can paint back over wax with a chalk type paint if you decide to do something different. Poly would have to be removed to repaint. I’m new new to your blog..& love it. 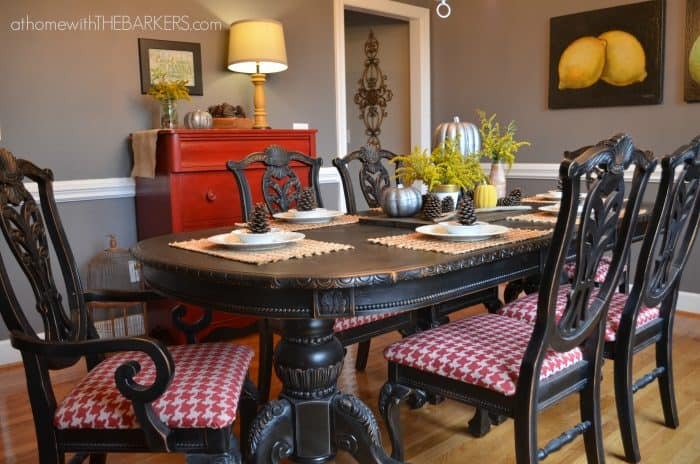 I especially love the black din.rm table re-do..where did you find the red houndstooth fabric? Thanks ,looking forward to your blog! So glad to have you! Hope you add your email to the subscribe box so you can get the new post right away! That hounds tooth fabric was bought from a local discount place a few years ago. I am not sure that brand, sorry! wow wow wow, what a marvelous job. 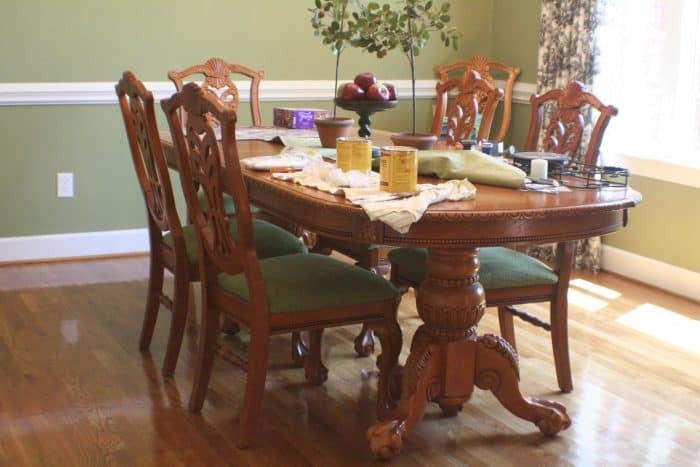 This dining table look absolutely amazing after the redo. Absolutely fabulous change!! What a difference some paint can make!! Great makeover. Thanks for sharing! Just wondering did you use some Annie Sloan clear wax, or was it some sort of other wax? Awesome job btw, I think you have convinced me to try it myself. Thanks! I did use Annie Sloan clear wax because I already had it on hand. Good Luck! Wow! Those were nice chairs before. I think I would have been nervous about messing them up. They look wonderful painted, though. I like the distressing, too. It’s just the right amount to make it interesting. Looks amazing!! I need to do mine too. Did you sand first, did you prime and how many coats did you do? Thanks so much! No sanding, No priming, and 2 coats of spray paint. I just bought a round dining table with 4 chairs off of a local online yard sale page to use as a breakfast table in our kitchen nook. I am in the process of doing EXACTLY what you did to your dining set. You inspired me to go for it. I’ve already painted the chairs and reupholstered the cushions with an orange and ivory chevron fabric. It is looking like I paid a fortune for it already. Truth is, I snagged that set for just $150.00! Thank you for the idea and for providing the type of paint you used, etc. I wish I could show you a picture of mine 🙂 Blessings to you! No, mine did not feel sticky. Maybe you tried to use the furniture too soon after you painted it. Depending on which paint you used they can take longer to cure. Somethings can take a lot longer than others. Not priming or sanding before just clean well. I used Annie Sloan Clear Wax. Wow. That doesn’t even look like the same table and chairs. Simple spray paint can totally transform the entire design of the table set. 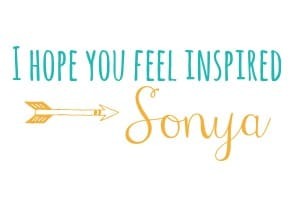 Hi Sonya! I love your dining set makeover and I think my DIYFM readers will too. 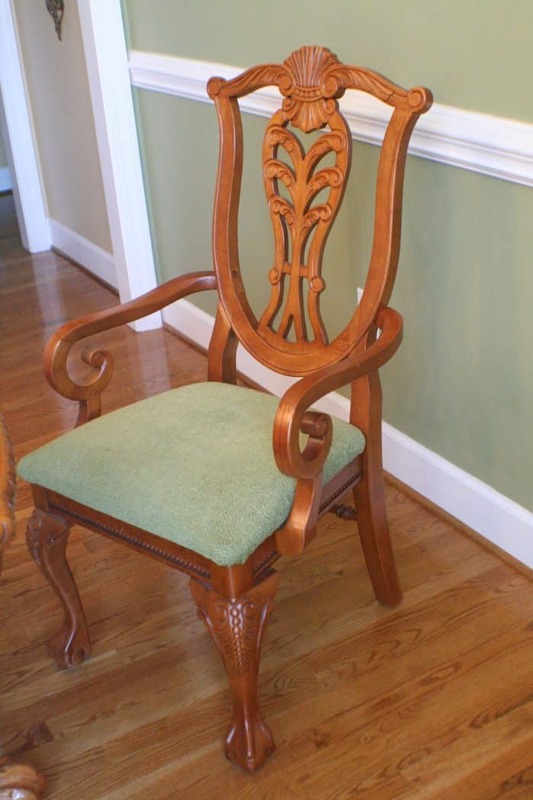 Would you mind if I feature it on my 2nd blog DIY Furniture Makeovers (http://diyfurnituremakeovers.com)? I’d use one before and one after photo, write a brief description, and post a link back here. Let me know if that’s alright. Thanks- hope you’re having a great weekend! This is the most stunning make over I have seen in a very long time. I absolutely love it and your work is amazing. 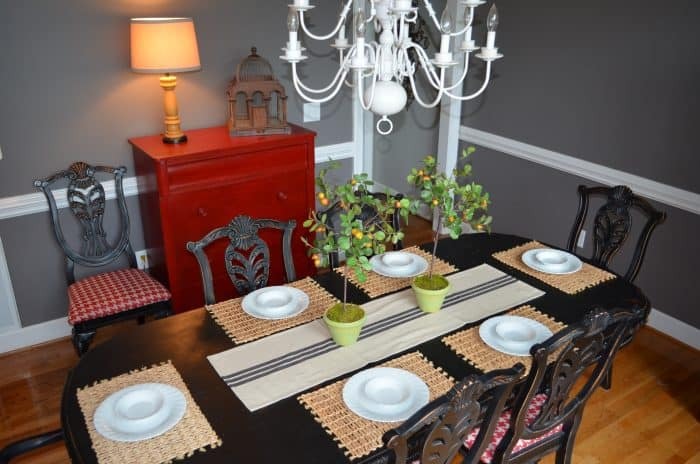 Love the black dining table and chairs! How did you do the distressing on the edges? I used sandpaper. Try 120-150 grit. Nothing too rough it will scratch all of the paint.